Hidden behind the famous Handmade Paper Institute lies this unique store called Mahakhadi. 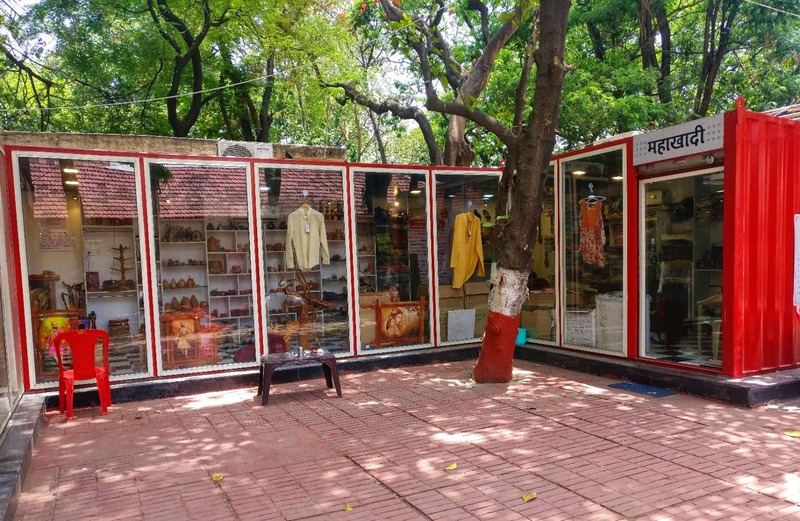 The store is an avenue for khadi craftsmen from Maharashtra to retail their products. From genuine leather chappals of Kolhapur to organic honey of Mahabaleshwar, from terracotta pottery and cooking vessels to handmade jewellery, handmade paper, and shawls, this store has it all. The Konkan region is well represented with some tempting hapus mango mawa and other local products. I found the meenakari copper work from Alibaug very fascinating and picked quite a few items from that shelf. It is also a good place to shop for handmade soaps and ayurvedic products. The wool sold here is noteworthy and the fabrics available here are all spun on hand charkhas. Now, doesn't that spark a patriotic flame within you? Mahakhadi takes immense pride in offering products that are untouched by any machine and yet are of the best quality. And do note that the pricing here is fairly within the reach of a common man. Starting at just INR 35 and going up to INR 10,000, there are products to suit all budgets and requirements. If you are not carrying enough cash, do not worry as there is a card machine available at the counter. They also plan to have workshops organised here to create awareness on khadi. While there is a wide display of products, I just wished it had a better display and some more products with a Puneri touch and definitely some Pune themed souvenirs.